A separate study found among those who consider themselves to be a vegetarian nearly 2/3 of them had indicated that they recently eaten meat when they asked to recall their diet. He goes on with the TEDxTalk defining these people as "reducetarians" rather than vegetarians, though the above claim is what I am skeptical of. What is this study that he is referring to? And is it valid only in the USA? There is no mention of it on the reducetarian website either. Surveys do apparently exist that support Brian Kateman's contention that about 2/3 of Americans who consider themselves vegetarian have recently consumed meat. However, there are a couple of caveats. Take a 2002 Times/CNN poll on the eating habits of 10,000 Americans. Six percent of the individuals surveyed said they considered themselves vegetarian. But when asked by the pollsters what they had eaten in the last 24 hours, 60% of the self-described "vegetarians" admitted that that had consumed red meat, poultry or fish the previous day. In another survey (link is external), the United States Department of Agriculture randomly telephoned 13,313 Americans. Three percent of the respondents answered yes to the question, "Do you consider yourself to be a vegetarian?" A week later the researchers called the participants again and this time asked what they had eaten the day before. The results were even more dramatic than the Times/CNN survey: this time 66% of the "vegetarians" had eaten animal flesh in the last 24 hours. While I cannot find the 2002 poll, the above article does link to a 2003 paper that analyses the data from the Continuing Survey of Food Intake (1994–1996, 1998) (CSFII) conducted by the Department of Agriculture (USDA). It's therefore research that is 12 years old on data that is between 16 and 20 years old. The dietary intake data from the survey were collected on 2 nonconsecutive days, 3–10 d apart, through an interviewer-administered 24-h recall using a multiple-pass interviewing strategy. IOW, the interviewees were asked the questions twice on different days. So, out of the 13,313, 334 were self-identified vegetarians of which 214 had consumed more than 10g of "meat" the previous day. 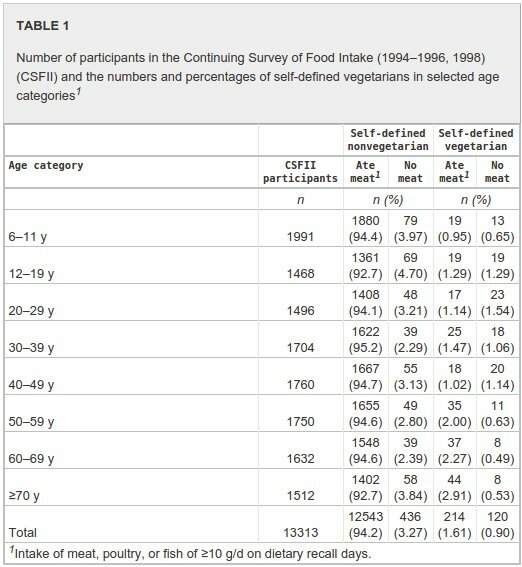 This pegs the number of self-identified vegetarians at 2.5% of the sample and self-identified vegetarians who ate meat the previous day at 64% which is close to Brian Kateman's claim. Incidentally, "meat" in the survey implies "meat, poultry, or fish". We therefore have no idea of knowing if these vegetarians were having a "meat relapse" or if they are of those (significant number of) vegetarians that consider fish or white meat to be OK, but not red meat. The terms semi-vegetarian and flexitarian already exist for the practice of reducing meat, seafood, and poultry intake. Reducetarian appears to be a neo-neologism. Not the answer you're looking for? Browse other questions tagged vegetarianism meat . Is it common that North Americans who call themselves 'vegetarian' eat fish?